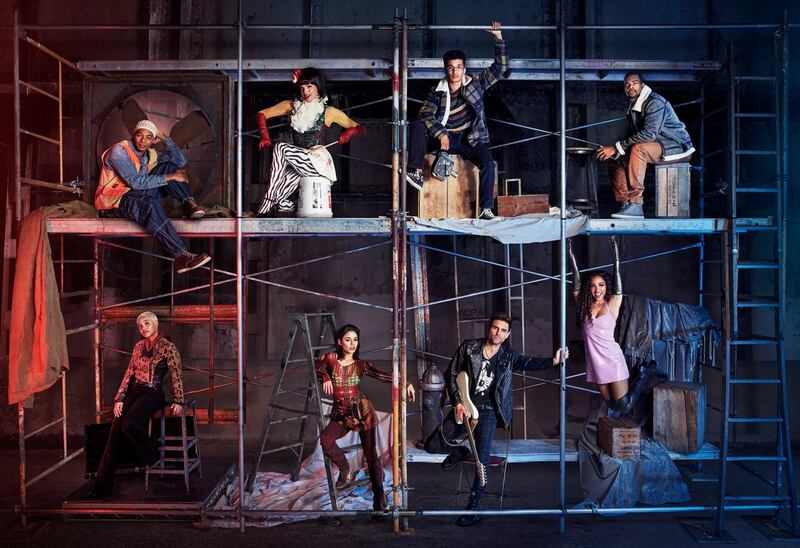 As a cultural phenomenon, the 1996 musical “Rent” is relatively easy to get behind, or at least understand: It features a multicultural cast of characters, a number of them afflicted with AIDS, that creates a sort of alternative family to help them through disease, addiction, hardship and the myriad romantic trials they inevitably inflict on each other. As a musical, though, “Rent” is difficult to love. Based loosely on Giacomo Puccini’s “La Bohème,” the show depicts bright-eyed young artists in pre-millennial Manhattan raging against consumerism, conservatism and gentrification. In other words, they can’t or won’t pay their rent. To some audiences this apparently feels like a trenchant critique of soulless capitalism; for many of us it just sounds like the entitled ranting of irresponsible 20-somethings, Peter Pans with tattoos. And Jonathan Larson’s all-singing score, though it has its share of musical high points, is awash in churning, witless recitative that sounds like a groove got stuck on a Stone Temple Pilots record. As a musical, “Rent” is difficult to love. Sunday night’s “Rent: Live” on Fox offered a televised rendition, in the vein of last year’s “Jesus Christ Superstar” and 2016’s “Grease,” with a live audience and a busy multi-camera staging. While it wasn’t a flat-out disaster, it was far from a triumph, and it didn’t do the show any favors. Yes, it brought us tableaus of black, brown and white folks of all orientations singing about their lives and loves on network television—a welcome sight that would have been inconceivable when the musical was first written, and for which it deserves some credit. But the quality of the performances, conveyed via a muddy sound mix, was jarringly uneven. Anyone unfamiliar with the original was unlikely to come away with a strong impression of the show’s merits (let alone most of its lyrics, unintelligible here), and those who already love “Rent” seemed, on the basis of my Twitter feed, to have been either crestfallen or conflicted. Some of the broadcast’s problems could be attributed to technical difficulties, as one actor, Brennin Hunt, broke his foot the previous night. For this reason, most of what we saw on Sunday night was not in fact live but pre-recorded footage of Saturday’s run-through. That may excuse some of the broadcast’s rocky vocals and tentative acting, but certainly not all of it. Especially dampened was the central, doomed romance of Roger and Mimi, given precious little vigor or variety by Hunt or pop singer Tinashe. To give credit where it is due, some of original director Michael Greif’s staging ideas were inspired, especially moments on beds. A few songs strikingly linked the characters’ romantic assignations to their eventual caregiving roles, turning the meaning of love from sexual to selfless. A bed also featured centrally in a rousing “Take Me or Leave Me,” which handily showcased two of the broadcast’s liveliest performers, Vanessa Hudgens and Kiersey Clemons. While it wasn’t a flat-out disaster, it was far from a triumph. But most of the show’s best moments featured the entire cast, particularly a moving choral rendition of “Will I,” which gives voice to the fear of people with AIDS that they will die alone, sans dignity or affection. As the cameras swooped among the scaffolding of the set and across an audience holding electric candles, the soaring harmonies both put us in the center of that fear and provided an antidote. And as Collins, a philosophy professor who loses his lover, Angel, to AIDS, Brandon Victor Dixon dug deep and turned the reprise of “Cover You”—a song he had previously sung as a sunny duet with Angel—into a rousing gospel moment, ending the song in a supportive embrace with the ensemble that beautifully literalized the song’s sentiment. It shouldn’t be a surprise that Dixon was a standout; a seasoned stage performer, he was the anguished Judas of last year’s “Jesus Christ Superstar” broadcast. “Mary Poppins Returns,” but what is she doing here? Yes, I know, there’s also “Seasons of Love,” an anthem whose charms have always eluded my cold heart, maybe because it’s always sounded to me too much like a commercial jingle (and has in effect long served as a kind of ad for the show). Staged in context as an affirmation at a support group for people with H.I.V. and AIDS, with vocals led by the extraordinary Keala Settle, it came off about as well as this song can. That is, until the very end, when viewers were treated to one of the evening’s only genuinely live moments: a reprise of “Seasons of Love” in which the new TV cast was joined by the original Broadway cast, including Idina Menzel, Jesse L. Martin and Anthony Rapp. This moment didn’t make me cry, exactly, as I have no nostalgic heartstrings to pull for this show. But it did make me feel and admire its huge contribution to a culture that has since produced better musicals, from “Hamilton” to “Fun Home” to “Dear Evan Hansen.” All owe a debt to “Rent,” and I for one am happy to pay it. I cringe to call this piece a basically sensitive treatment, The “can’t or won’t pay their rent” hedge nods toward mercy, but is contrived at best, but that tone pales in comparison to the the bitter sarcasm in the phrase “soulless capitalism” that is an insult, followed by the Peter Pan reference and “irresponsible 20 somethings” statement for just plain injury. I don’t find this attempted balanced approach to a critique of Rent to be representative of a Catholic perspective whatsoever, the cursory attention to dignity, undignified. It angers me, Rob, the stink of your own opinions are coming in clear when you use the word “us,” a clear contrast from “some audiences” in your attempted contrast of a merciful attitude with the perspective of a more successful and privileged adult. My advice: stick with mercy in this zine. This piece is not universal in tone, and I’m not sure why it’s included in a Catholic magazine. What is the point of publishing it, America? To make struggling Jesuit artists not to mention the LGBT-Q community dislike you? I didn’t think that was what you were about. Because America magazine has a wide variety of readers with varying opinions of taste, Mr. Weinert-Kendt has done a fine job of gesturing to the objective reality that one generation's "Belle of Mayfair" is another's "Fantasticks," and any attempt to pry them from their cold dead senses of taste is fruitless. In the face of this, the reviewer admits his own bias, and backs it up with facts related to this lackluster performance and its original. There's nothing more universal to Catholicism than "taste." I have no doubt that the Hays Code and Motion Picture Censorship in the 1930s would have had serious issues with productions that get nods of approval from today's religious authorities. In a magazine that attempts to demonstrate the lie to the notion that there are "conservative" or "liberal" Catholics, this piece does a fine job acknowledging the work's importance as well as its drawbacks. We shouldn't expect anything less from a critic. Besides, I am sure there are other places one can turn if they want mercy rather than criteria when it comes to evaluating theatre...after all, even when kindergartners perform Shakespeare, it is still Shakespeare, n'est-ce pas?